January 18-22 is the week which, according to the calendar of Verkhovna Rada, must be spent ”working with the voters”. To assess the quality of this work we visited several deputies’ councelling offices. Yuriy Solod is a member of the “Opposition block” faction and Natalya Koroleska's husband. 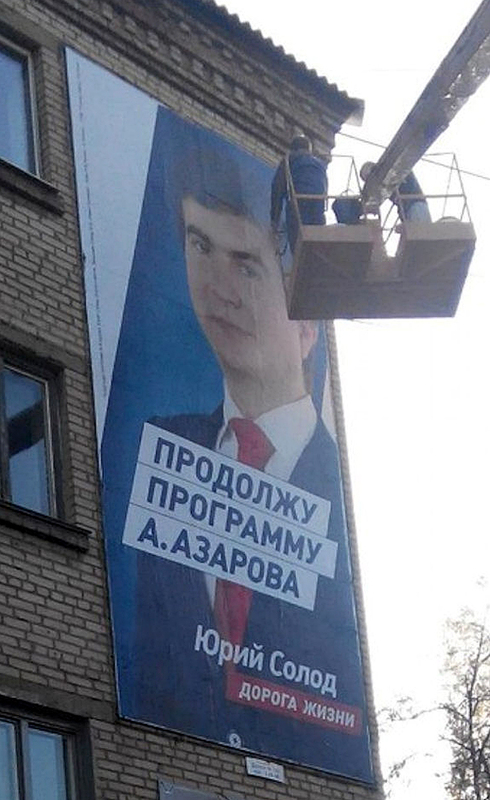 He became famous after promises to continue Oleksiy Azarov’s programme (ex-Prime Minister's son who fled to Russia together with his father). According to Verkhovna Rada site, Solod has some inexplicable difficulties with checking in in writing and, according to the data, he has been absent from 69% of plenary meetings. Maybe, the trick is that somebody checks in the deputie's card even while he is absent? His tax declaration, which says that his income in 2014 was only 36 thousand hryvnyas is extremely surprising. However, the deputy is really active on the Internet. Just before our visit he had informed on his page in VK that the week of working with electors had begun and he would be waiting for people in his office #120 in the town council. We decided to find out if it was really so easy to meet the deputy on the venue which he had appointed himself. Maria Sereda and Kateryna Pyrih, “Donbas Strong Communities” activists, visit councelling offices regularly, on the days which are designated by Verkhovna Rada calendar, but they have never (!) seen deputies working there. Oleh Zontov, the previous mayor, established a tradition of keeping all the civil servants' doors open for people in the town council. This is why the current mayor cannot just close the town council doors on people. Everyone here knows the activists and the security officer waves his hand greeting them. An officer of the Security Service of Ukraine, dressed in civilian gear, knows them as well and greets us heartily. He does not even ask who exactly we want to see and takes us to Yuriy Solod's councelling office. “Shall we come in?” says Masha and knocks on the door. There is a desk in the middle of the room and Alyona Karpushlyna, the deputy's volunteer assistant is sitting at it. “Mr. Solod is working in Slovyansk and Oleksandrivka districts today”, informs us Karpushlyna. “But you know that Ms. Korolevska...”, Masha has no time for surprise. “Mr. Solod came according to his schedule and Ms. Korolevska according to her schedule”, corrects herself Karpushkyna. “You don't want to know it, really. 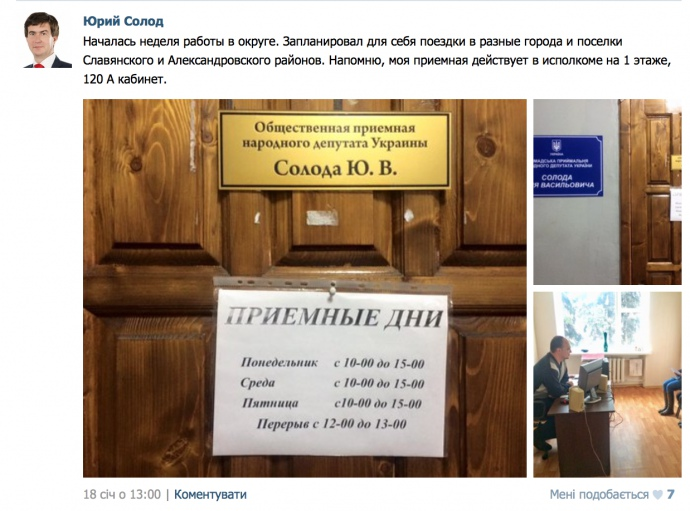 Mr. Solod has a site where his timetable can be found without any problems.”We failed to find the site on any of the resources connected with Solod, including the official site of Verkhovna Rada, “Opposition Block” party site or social networks. The only link to something that looks like Yuriy Solod's personal site is a link to the “Road of Life” charity organization. Yuriy Solod cooperates with it and it looks like he arrives in Slovyansk in connection with its activity. The deputy’s assistant cannot tell us his working timetable.